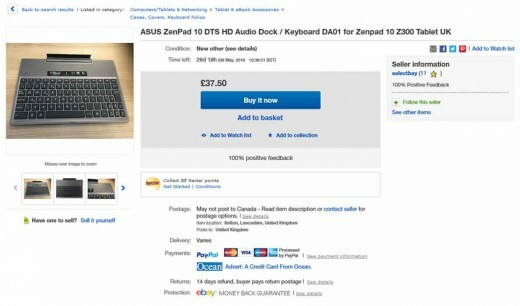 UK Shoppers – Finally a ZenPad 10 Audio Dock Keyboard available to buy! Update: Sorry folks, this eBay listing has ended and we are now trying to find other options for UK shoppers. One of the most common questions we get at zenpad.org is about the illusive ZenPad 10 Audio Dock keyboard. This is especially true from UK visitors who have been asking when or where they can buy it in retail. Thanks to the heads up from one of our visitors, there is a chance right now to buy a new Audio Dock keyboard for those in the UK. I don’t suspect there are many in stock so I suggest getting in on this quickly before these sell out.